The AMD RX-412ND-powered QNAP TS-x73 lineup targets small businesses and power users, featuring 4, 6, and 8 drive bays. In addition to the aforementioned processor and 4 GB or 8 GB of memory, its list of features also includes 2 PCIe Gen3 x4 slots for increased flexibility, 4 USB 3.0 ports, and 4 Gigabit LAN ports. 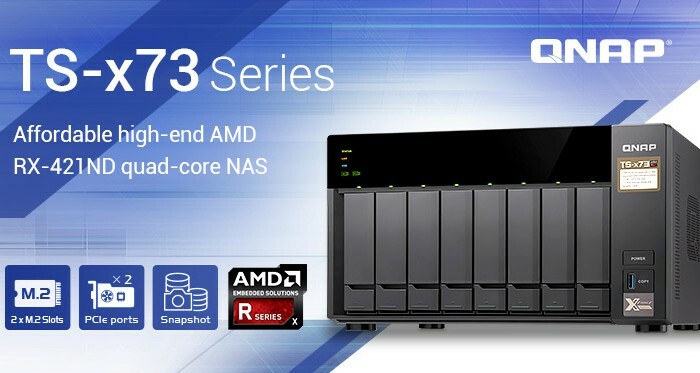 QNAP Systems has just launched a new NAS with an AMD processor inside, namely the TS-x73 series. This new storage solution for small business customers and home users with special needs comes with 4, 6, or 8 bays and is powered by an AMD RX-421ND embedded processor. The TS-x73 family comes with quite a few distinct models — in this case, there are six of them: TS-473-4G, TS-473-8G, TS-673-4G, TS-673-8G, TS-873-4G, and TS-873-8G. Each of these models features either 4 or 8 GB of memory, but expandable up to 64 GB. In addition to the AMD RX-412ND quad-core processor, the list of common features includes 4 x USB 3.0 ports, 4 x Gigabit LAN ports, 2 x 3.5 mm microphone jacks and a single 3.5 mm line out jack, 2 x M.2 SATA slots, and 2 x PCIe Gen3 slots. This storage solution comes with support for multiple virtual machines and containers, including VMware, Citrix, and other environments. There is also support for 4K video transcoding and HDMI output, but to improve the performance in this scenario, a low-end PCIe video card can be installed. At last, we should highlight that the storage space can be expanded using UX-800P, UX-500P, or REXP-1000 Pro expansion enclosures. The QNAP TS-x73 can be acquired from multiple QNAP Systems partners all around the world, so the prices will vary depending on the market and retailer.